Telework is a work arrangement that permits you to do all, or some, of your job from home. Telework is also known as telecommuting or working from home. I need to telework due to my disability. Does my employer have to allow it? It depends. The Americans with Disabilities Act (ADA) is a civil rights law that protects employees with disabilities. Under the ADA, employers have to provide reasonable accommodations to employees with known disabilities, under certain circumstances. Telework may be a reasonable accommodation under the ADA. How do I know if telework could be a reasonable accommodation for my job? Can you do all of the essential functions of your job from home? How feasible is it for you to set up a work-site from home? Does your job require access to specialized equipment or programs? Are there any unique aspects of your job that would make telework difficult? What does your job description say about physical presence in the workplace? Have you ever worked from home before? If so, was it successful? Do other employees in your organization work from home? If so, are the other employees in jobs comparable to yours? Does your employer have a telework policy? If so, this may be helpful in showing that telework is reasonable. Are there any other accommodations that would be effective? If so, your employer may choose to provide an alternative accommodation, so long as it is effective. For example, assume you ask to telework because you take a medication that makes you drowsy in the morning. Instead of permitting you to telework, your employer suggests that it can modify your work hours so that you can begin work after your drowsiness wears off. This is likely permissible under the ADA, so long as it is effective for you. How often can I ask to telework? Telework, like all accommodations, is considered on a case-by-case basis. For that reason, some employees need to telework every day on a permanent basis, others need to telework every day, but only for a limited period of time, others need to telework one or two days per week, while others may need to telework on an “as needed” basis for unpredictable flare-ups of symptoms. Your request should reflect your disability-related needs. What do courts think about telework? Court cases often depend on very specific facts about the employee’s job or employer. Unfortunately, many recent court cases have ruled against employees seeking to telework as a reasonable accommodation. These cases have emphasized that in many jobs, physical presence in the workplace is essential, especially if a job requires teamwork, personal interactions with clients and supervision of work. While there are also some cases with more positive results for employees with disabilities looking to telework, these court cases require you to be thoughtful and flexible when asking to telework as a reasonable accommodation given the uncertainty in the courts. I want to ask to telework as a reasonable accommodation. What should I do? Think through the factors outlined on page 1 of this Fact Sheet to consider whether you think telework would be reasonable for your position. These factors can also be found in the Employee Worksheet at the end of this Fact Sheet. Develop a plan about how you can telework while still successfully performing the essential functions of your job. Use the Employee Worksheet in this Fact Sheet. Let your supervisor or human resource department know that you need a change at work because of reasons related to your medical condition. Make your request in writing and use the phrase: “I am requesting a reasonable accommodation under the ADA.” Use the Template Letter in this Fact Sheet and keep a copy of your written request. Tell your employer that you have thought about how to make this accommodation work and ask if you can go through your plan. Be prepared to provide reasonable documentation about your disability and why telework relates to your disability and would help you perform the essential functions of your job. well as alternatives, with your employer. This is particularly important here, given the uncertainty of the case law. Depending on your employer’s response, if possible, be flexible about the frequency you are asking to telework. If your employer refuses to permit you to telework, be flexible and open-minded when considering alternative ways to accommodate your disability. I need to telework for my disability. However, telework would not be reasonable in my current position. Do I have any options? Yes. You should consider whether the reasonable accommodation of reassignment would work for you. Please see the Employment Rights Helpline Fact Sheet about Reassignment as a Reasonable Accommodation to learn more. I have more questions about the reasonable accommodation process. Please see the Employment Rights Helpline Fact Sheet about Requesting a Reasonable Accommodation to learn more. Where can I learn more about telework? Equal Employment Opportunity Commission, Enforcement Guidance: Work at Home/Telework as a Reasonable Accommodation. I am writing to request permission to telework as a reasonable accommodation under the ADA. As you may know, I have a disability (you may list your disability here or wait for your employer to request documentation of your disability) and this accommodation would help me be successful at my job. I am confident that I can perform the essential functions of my position from home. I would be happy to meet with you to discuss my plan and proposal to explain why I think this can work. If you have any questions about accommodations under the ADA, you can feel free to contact the Job Accommodation Network a 1-800-526-7234 or the Great Lakes ADA Center at 1-800-949-4232 for more information, free of charge. 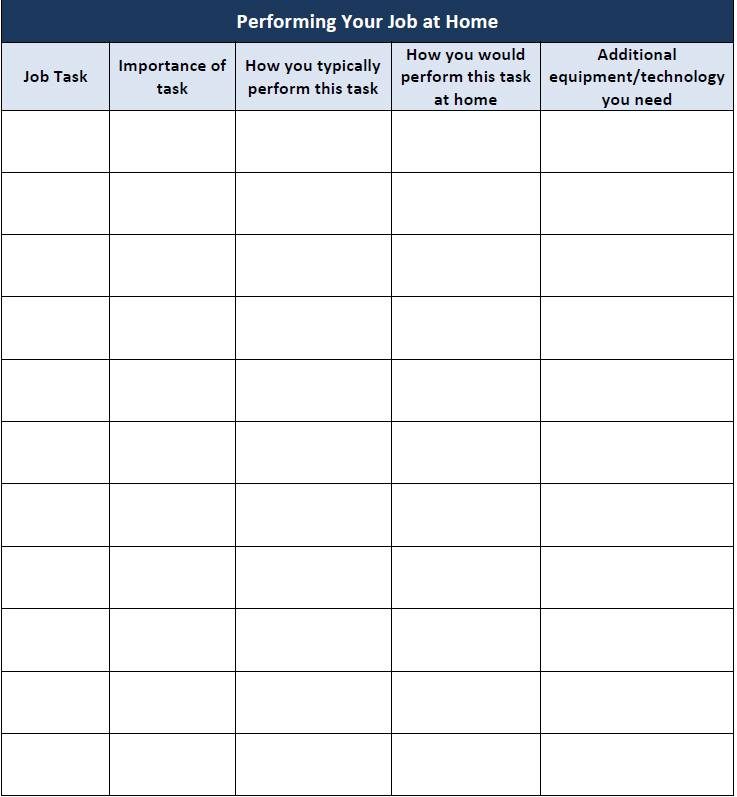 Use this worksheet to help organize your thoughts about the essential functions of your job and how they can be performed at home. Remember, your employer does not need to remove any essential functions of your position. 1. Are there any unique aspects of your job that would make telework difficult? 2. What does your job description say about physical presence in the workplace? 3. Have you ever worked from home before? If so, was it successful? 4. Do other employees in your organization work from home? If so, are the other employees in jobs comparable to yours? 5. Does your employer have a telework policy? 6. Are there any other accommodations that would be effective? 7. Do you have written documentation from a health care professional that supports your request to telework?